Listen to the podcast. Find it on iTunes/iPod and Podcast.com. Read a full transcript or download a copy. Sponsor: Ariba. Guptill: The first thing is to figure out how to handle this cloud thing. It's the single most disruptive influence that we've seen in not just IT, but in how IT is bought, used, paid for, and how that affects how everybody does business. So how is it accounted for? Who has responsibility for managing what aspects? If you have some of it on-premise and some of it out in the cloud, who is responsible? How is it managed? How is that budgeted for? If you have some of it on-premise and some of it out in the cloud, who is responsible? How is it managed? How is that budgeted for? It changes the way we operate as a business, because it changes the way we spend, the way we buy, and the way we manage. It's very, very disruptive, and policies and practices really haven’t caught up yet to the reality, and we're not getting a breather. The change is accelerating. Sawchuk: When we ask procurement executives what are they focused on going into 2010 from a technology standpoint, the number one area is just utilizing better the technology investments that they have made -- digesting them. So, it's a lot of the basics -- cleaning up our master data and just getting more utilization on our eProcurement, eSourcing types of tools in the organization. But there are a couple of emerging trends that are occurring in the most progressive procurement organizations, in three areas. One is around collaborative technologies. Why is it so difficult to do this in business, when it's so easy with Facebook and all that type of stuff in the non-business type of world? It's not just externally that this applies, but internally as well. The cloud offers a way to do that a lot more quickly, for less cost, in a way that is still as secure and authenticated as it would be in my IT shop. Number two, around better management of the knowledge and intelligence across the organization, structured, unstructured, internal, and external types of information. And lastly, driving more agility into the procurement service delivery model, which includes the technology tools. Mahowald: For the last 10 years or so, we have seen lines of business start to get more acclimated using software-as-a-service (SaaS) services. Some of those lesson s are how those services are delivered and filtered back to IT. 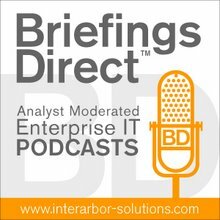 Virtualization, automation, and standardization are finding their ways into our IT departments and they're finding ways to do things like reduce the number of physical assets they spend their time counting, and keep them up and running, and rely more and more on external services that can safely provide the functionality that their users require. And the typical scenario is that, if I am in the line of business and I want to build an application, or I need to have access to an IT service, I've got to go to my IT team. It can often be long and time-consuming to get that thing spun up and tested, kick all the tires, and get it up and running in the environment that is being used. The cloud offers a way to do that a lot more quickly, for less cost, in a way that is still as secure and authenticated as it would be in my IT shop, and probably done in a way that is much, much more service enabled, for the ultimate constituency I want to serve, my user, the internal user. So, it's a big opportunity. North Rizza: Basically, what we're seeing is that companies have a lot of pent up demand over the last couple of years. They haven't been able to change some of their business processes and automate them the way they would like to. What they've been doing is standing back, trying to get more out of their ERP systems or basic business processes. They've had to make a lot of cuts and they're not getting everything they need. What we're finding now is that spending is starting to pick up. We're also finding that companies are looking for alternative deployment models. They're starting to say, "What can I do above and beyond just the technology application? Where else can I look for services and other opportunities that are, one, going to quickly drive value to my line of business buyer, because those are the folks that do the business day in and day out? They're the ones that need to make a difference. And finally, how do I do it quickly, without a lot of disruption, very flexible, and a great investment, but a really quick return on that investment?" Sawchuk: When we asked CFOs in the broader enterprise, coming into 2010, what was the number one area of focus for them, it was cash. When we asked the same question to the procurement executives and community, it was cost. Cash was number 10. So the question is, are we misaligned or do we feel that we have done everything we can over the last 18-24 months and there’s nothing more to do? When you look at this, procurement and the data as just being cost focused are fading. We've got to get much more balanced in the way we actually deliver our value, not just cost, but also working capital and other areas as well. You wanted some examples of what these world-class organizations do around working capital and how they do it well. Number one, they measure it. They bring visibility to it. They put it on their scorecards. They have cash conversions, cycle time matrix, DPO, DIO, etc. Number two, they manage it and the source-to-settle, purchase-to-pay process. Number three, they create collaborative communities with procurement, with the business, finance, and treasury, around working capital strategies and objectives. And, fourth, they actually compensate. We see organizations out there where some of the procurement folks and these folks on these collaborative communities are compensating. Up to one-third of their compensation is based on their achievement of working capital objectives. Mahowald: In many IT organizations, as much as 55 percent of the budget is spent on keeping systems running, and that involves paying for the ongoing license and maintenance and support of software and hardware and all the power pipe cost that it takes to run an IT center. The ability to reduce some of those costs by outsourcing them in lower-cost subscription models that are operating costs is an enormously helpful transition for many customers. CIOs that we talk to are excited about introducing cloud services and also what we call naked compute services or offsite storage to improve the efficiency of certain applications that are widely used in the organization or offsite development platforms, where they can actually build applications. It’s a major activity for many IT organizations to build new applications, objects, and customizations on-site. If they can offshore that and not have to pay application licenses or infrastructure cost, that’s a big help to them in lowering their fixed-cost structure. Ultimately, it's a big help to make IT organizations much more lean and responsive to their needs. Guptill: If you can take the software and put it in the cloud, and if you can take the hardware and the infrastructure service, the IT, and put it in the cloud and take advantage of that, we have all these vendors -- let's take Ariba for an example -- that have these terrific technologies, applications, and the expertise to use them. Why can’t that be delivered and used as a service, as a utility, cloud-based or otherwise? Then, we have the business logic, we have the software, the applications, the functionality, and the technology, to make it happen. We can do that as an as-needed, on-demand, or subscription basis. It removes a lot of the fixed cost that we've been talking about. It reduces our reliance on fixed assets or fixed cost for what could be cyclical or temporary needs in terms of functionality. It's basically outsourcing business tasks, business functions, or business processes to the cloud. It's "cloud temping" basically. Over time, these things start from very simple, straightforward, and standardized capabilities, similar to what SaaS, or infrastructure as a service (IaaS) started as, but we are seeing them start to evolve into more configurable or more customizable capabilities. So that we can now -- it's just starting now, but will be much more over the course of the next four or five years -- take advantage of a large pool of business functionality that we don’t want to buy. It's not just a technology. It's not just a software. But it's the business tasks that we don’t want to buy, we don’t want to train, and we don’t want on our books. We can rent those as we need them, and when the work is done, they retire back to the cloud. North Rizza: We found that 96 percent of those in our studies are using cloud-based solutions, but out of that 96 percent, 46 percent are geared into a hybrid cloud solution. And by hybrid we mean that they're actually using cloud technology applications. They're optimizing those against their IT on-premise investments, and further, they're extending the capabilities into cloud services technology. So they're looking at the whole gamut. When it's executed well and done well, it allows you to execute on your working capital and supplier payment types of strategies. The second part of that is the next leading area, and that’s 41 percent around a private cloud. The difference there is that they're looking at technology capabilities from the cloud and they're putting that with their ERP or on-premise IT investments, but they're not necessarily extending those capabilities. ... We found that those that actually deployed cloud solutions, technologies, and services and put them out there, found anywhere from 5-7 percent difference in greater value, just by deploying, versus those that are thinking about it or trying to get into the mode of, "We want to go down that path and we are thinking about that investment process." What were the benefits? It's really interesting. The first is that they were able to drive more revenue. Understandably, if we get those cloud-based solutions, we're going to drive more revenue. If you think about that gap from 5-9 percent, that’s huge, on a revenue standpoint. Two other points: the cost-to-serve model. They're able to look at what their costs are, what are costing to serve from the enterprise, all the way through their trading partners, all the way back out into where the demand cycle begins, from a supply chain perspective. They get more savings, and those two go hand in hand. Then lastly, it's around that business cycle time improvement aspect. ... So, while we see this as a big area, and companies keep going down this path, one of the things we also find is that it really means a sharper focus on master data management (MDM), your business processes, how that’s orchestrated, both inside the enterprise and externally into your trading partners, and understanding your governance structure. We'll see more and more of that come out, as time goes on here. Sawchuk: We've been talking about the cloud. How does it help? First of all, and you've heard a lot about this, cloud gives you much faster, easier, and more economical access to technology solutions. Now that you're connected, you can speed the transactions across your supply base, etc. More importantly, it gives you much more predictability in your ability to execute. For example, a lot of us say we moved our terms. We moved our terms from 45 to 60 days. When we do that, the suppliers say, "When we were on 45, you couldn't pay me on time. You moved it to 60. Can you pay me now on time?" It gives you some predictability in the execution. That's important to them. Number two is, if you negotiate early pay discounts, you have the ability to execute and take advantage of those kinds of things that you have in your commercial agreement. The cloud also does a couple of things. It certainly brings much more visibility to the overall activities that are occurring across the entire source-to-settle process. But also, once you are connected in this whole cloud environment, it certainly gives you access to intelligent services that exist out there. I'm talking about working capital, things like information about the financial health of your suppliers, their historical performance, the cost of capital, etc. That kind of collision between outside the cloud and inside the organization is going to change and it could change business pretty dramatically. Mahowald: We talked about lower cost, leaner IT organizations, because they are able to source outside of the organization, and get lower cost services. We think that kind of collision between outside the cloud and inside the organization is going to change and it could change business pretty dramatically. Another thing is that, when you've got solutions that are brought in by business users -- maybe it's a salesforce.com or some other SaaS application -- it's important to them, and it's important for them, to get agility and speed to that functionality, but there are going to be many places where you are going to be brought outside of your organization, because that's where business happens. Whether it's in a commerce cloud or another forum or marketplace for the exchange of products, you will be forced there essentially to do business, to maintain your presence in the game, see that transparency, and have it help your business. We think that's probably the most likely place for that collision to occur. Guptill: We've researched, interviewed, and surveyed a little over 7,000 executives worldwide -- finance, procurement, HR, IT, line of business -- over the last six or seven years about what it is that they want to do with cloud IT, whether it's SaaS or IaaS, platform as a service (PaaS) or whatever. In every single case so far, they're using it to add to what they have. It's filling in the gaps. It's enabling better efficiencies, better cost. It's delivering benefits that they could not get earlier cost effectively. When you think about it, that’s the pattern of IT investment over the last 50- 60 years. It's very, very rare that we replace what we have with whatever new is coming in. There's all this hype about new stuff is coming and it's going to change everything. It's going to get rid of this. We are going to dump that. Within four to five years, by year end 2015, more than 50 percent of new IT spending will be in the cloud for the first time. Our latest survey research, which we are just in the process of publishing right now, very strongly indicates that within four to five years, by year end 2015, more than 50 percent of new IT spending will be in the cloud for the first time. That’s within four or five years. But, that means that about 50 percent, or a little less than half, is still going to be on-premise, so that stuff is not going away. So, over time, what's going to happen is that we have a series of decisions to make. What costs are we trying to control? How are we going to change our purchasing, procurement, management, payment, relationship management, and so on? Then, as our traditional on-premise systems, not all of them, but as each one comes up, as they reach the end of their useful life, what do we do? Because traditionally, we would add to them, we would just build out around them, until they take over the entire data center, or we would outsource. Now, we have a combination. We can put some in the cloud and some on-premise. Those are the decisions that we're going to have to face, as we go ahead. What goes out there? What stays in here? What goes in between? The stuff has to be made to work together. Who has that responsibility? What's it going to cost? How is that going to be budgeted? And how are we going to manage all this?